wicktheatre > Archive > Performances > Watch It, Sailor! Finally! The Wick Theatre Company emerges! This is their first production under this banner! – The programme advertised both, ‘The Young Wick Players’ and the ‘Wick Theatre Company’ on its cover. October 31 November 1, 2 & 3, 1962. Barrie Bowen – Albert Tufnell A.B. Raymond Hopper – Carnoustie Bligh A.B. Ross Workman – Lt. Commander Hardcastle R.N. Programme Note: Watch It, Sailor! FM wrote: “It is with much pleasure that we are at last able to present for your entertainment this comedy – the sequel to our very successful production of Sailor Beware! 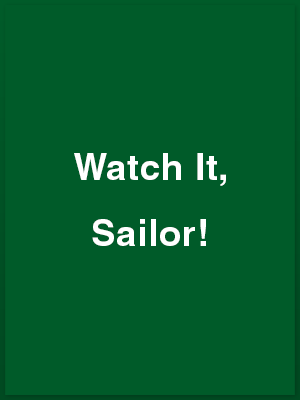 Publicity #1: Watch It, Sailor! Three years ago Wick Theatre Company – then Young Wick Players – presented that riotous comedy of pre-wedding jitters, Sailor Beware! at Barn Theatre, Southwick. Now comes an opportunity to the luckless sailor bridegroom who jilted his bride at the last moment because of his bossy prospective mother-in-law, for the company to stage Watch It, Sailor! which carries on from where the other play left off. There will be performances of this first-rate spot of nonsense by Philip King and Falkland L. Cary on Wednesday, Thursday, Friday and Saturday with the same cast which staged Sailor Beware! Without spoiling anyone’s fun, I hope, I can reveal that this time it is Shirley Hornet, the bride, who fails to walk up the aisle on time! The company should be in fine form, for tomorrow (Saturday) the play will have a preliminary run through, prior to presentation at Southwick, for the amusement of patients at Hellingly Hospital. They also so watched Sailor Beware! three years ago. Review #1: Watch It, Sailor! Rarely can the stalwarts of the Royal Navy have had such a stormy passage as do the two able seamen heroes who appear in the Wick Theatre Company’s production of Watch It, Sailor! which opened in the Barn Theatre, Southwick, on Wednesday. The company was formerly known as Young Wick Players. Though the progress of our two AB’s is certainly not as smooth as the Royal Navy might hope for, the producer Frances Moulton, has turned out a polished and quick-moving play. The action takes place in the living-room of Henry and Emma Hornett’s house. Their daughter, Shirley [Elizabeth C. King] has been left standing at the altar in the local church by Able Seaman Albert Tufnell [Barrie Bowen], who later arrives back in the house as bold as brass, accompanied by his best man, Able seaman Carnoustie Bligh [Raymond Hopper], an upright Scot. Shirley, the dejected bride, is big-hearted enough to forgive her wayward groom and agrees, under pressure by her bridesmaid, Daphne Pink [Clodagh O’Farrell] to walk down the aisle once more. Everyone is happy, including Henry Hornett [Ralph Dawes] who appears rather more concerned about feeding his beloved ferrets than giving away his daughter. However, the fly-in-the-ointment is Mrs. Emma Hornett [Betty Dawes], a sergeant-major type mother who towers above her henpecked husband and rules the home with an iron hand. Only very reluctantly does she agree to allow her weeping daughter to go once more to the church. When all is ready and the bride is prepared to face the crowd of people outside, waiting to see her second attempt at marriage, a bombshell of a telegram arrives, saying that for legal reasons the wedding must not take place. Mrs. Hornett explodes. The greater part of her wrath falls on her simple, meek and mild sister, Edie [Betty Elliott], who gives a really hilarious performance. Matters are not helped any by Mrs. Hornett’s gossip-collecting friend, Mrs. Lack, and it is not until the arrival of Lieut.-Commander Hardcastle, R. N. [Ross Workman], that things begin to sort themselves out. In the nick of time, the fiery Mrs. Hornett relents and the bells chime as the wedding takes place. Fine performances are given by everyone, but particularly impressive are Betty Elliott, Betty Dawes and Barrie Bowen. The play, which ends tomorrow [Saturday], will be repeated on November 10 in St. Mary’s Hall, Shoreham, in aid of St. Nicholas’s Parent-Teacher Association School and Re-building Fund. Review #2: Watch It, Sailor! Perhaps Watch It, Sailor! is not quite the riot of fun that Sailor Beware! was, but the Wick Theatre Company gave us a hilarious evening at Barn Theatre, Southwick, last week. All of the original characters are there. Betty Dawes repeated Emma Hornett and if she was not quite as noisy as the part demands, she more than made up for it by sheer forcefulness of character. Her unhappy husband Henry, still addicted to ferrets, and still capable of feebly asserting him-self, was delightfully characterised by Ralph Dawes. His ‘dippy’ sister, Edie, was played by Betty Elliott with a wealth of invention and drollery. Elizabeth Courtney-King as daughter Shirley was, also, perfectly in character. Barrie Bowen as Albert Tufnell, the sailor striving manfully to marry Shirley despite his own fears, Emma Hornet’s machinations, and the strangely revealed events of his own past, also did extremely well. Raymond Hopper, the moralising Carnoustie Bligh, and Clodagh O’Farrell as Daphne Pink who has designs on him, maintained the high standard of timing, pointing of lines, and getting the laughs that hall-marked this entire production. The noisy neighbour Mrs. Lack was Mary Gedge and Lt-Cdr. Hardcastle, Ross Workman. Frances Moulton did an efficient job of production and Barrie Bowen and Harry Chinchen contrived a suitable and workmanlike set with doors that really slammed and a window that really opened. Marking, as it does, the first venture of the former Young Wick Players under their new style this production augurs well. This type of farcical comedy is extremely difficult to handle, especially on a small stage, and if Wick Theatre Company can bring this same crisp efficiency to their future productions, they will not look back.